The Nigerian Pidgin: A Prostitute in Nigeria. There is no doubt she has satisfied the libido of all and sundry, but nobody cares for her well-being. Everybody wants her to caress, massage and ride their horny bodies without the attention of making her a wife. They pick her up at will, use and dump her like a used condom. She has suffered the fate of women in a patriarchal society who are regarded as objects rather than subjects. What will you call this? Marginalization? That is an understatement. This is what the bible calls 'spiritual wickedness in high places,’ but I will call it 'spiritual wickedness in higher places.’ Unfortunately, this has been the pitiable fate of the Nigerian Pidgin. There is this slang, 'who you epp?' among Nigerian youth, and I believe if this question is directed to the Nigerian Pidgin, it will provide lots of answers. The questions are: Who has the Nigerian Pidgin not helped to express his/her thoughts? Hasn't it function as a lingua franca in Nigeria? Why then do we see its users as illiterates despite the fact that graduates, professors, lawyers, doctors, engineers use it to express their thoughts? Why is its use in a formal setting frowned at? In language study, no language is more prestigious than the other, but why do we accord more prestige to the Standard English despite the numerous functions of Pidgin. Below are images showing such marginalization. There is no doubt that the Nigerian Pidgin has improved the propagation of national ideas, linguistic, socio-cultural and political development as well as the peace and unity in our beloved country since it is the only language both the educated and uneducated, irrespective of their different ethnicity, can identify with. 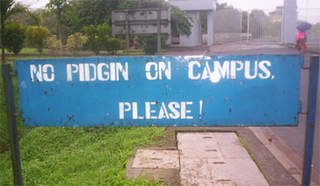 To further validate the authenticity of this claim, Okoh (2006) opines, "Whether language purists admit it or not, pidgin has in recent years steadily grown into a formidable linguistic force, a communicative phenomenon even institution to be reckoned with in Nigeria." Indeed, the Nigerian Pidgin has made enormous inroads and advancements in different domains of Nigeria's linguistic life. It is quite unfortunate and pitiable that a language which has helped so many to easily and fluently express their thoughts is treated as a prostitute. It has no official recognition despite the efforts of some literary icons like Ola Rotimi and Tunde Fatunde who tried to give it an official recognition by making good use of it in their literary works: 'Grip Am' and 'No Food No Country' respectively. No wonder Okoh (2006) asserts that "Pidgin is like a child nobody wants to claim but people want to send it on errand." 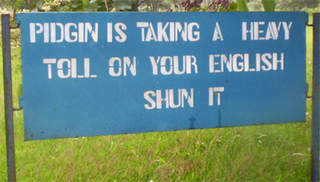 Similarly, the Pidgin English is like a woman everybody wants to sleep with but never wants to make a wife. For how long will you continue prostituting with a woman that isn't your wife? 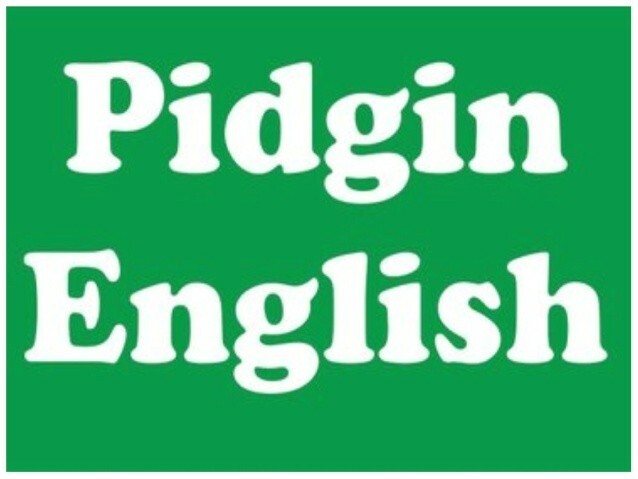 The Nigerian Pidgin has been marginalized to the extent that it is now saying, 'If you don't want to give me an official recognition like the Standard English, stop making use of me because I'm tired of this prostitution!' I think I am in support of its cry because what is good for the goose is good for the gander.